In preparation for taking on a new marketing and business development role at an international law firm (this was after I accepted the position but before I formally got my feet underneath the desk), I started looking over the activities of the marketing team and attempted as far as possible to evaluate it in relation to the practice groups and deal flow of the partners. I quickly discovered that there was absolutely no correlation between the activities of the marketing department and the business goals of the partners. It was as though the Marketing Department was on a different planet: one whose core currency were company-branded golf balls. 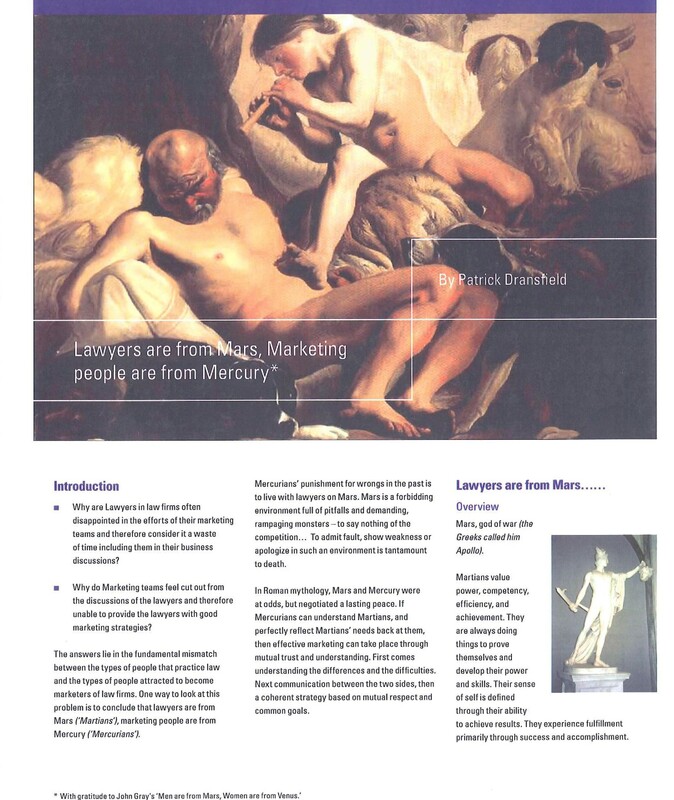 In a flash of inspiration, I realized that the marketing people were on Mercury, and the lawyers were on Mars! Admittedly, this was well over a decade ago and I hear you say that things have changed. A lot of water under the bridge – a lot of other stuff, too, as Bob Dylan would have it. And yes, in many ways, marketing and business development teams are more integrated into the law firms that they serve. But a recent conversation bears out that things have not transformed entirely. A good friend of mine who has recently transferred to Investor Relations with well over a decade of legal marketing and business development experience including high level strategic work, had to find a client legal representation, and in a hurry. She reflected ruefully that at no point had she considered calling on any of her extensive marketing contacts at law firms – but instead jumped in at partner level. She reflected that maybe her choice of eventual partner was to some degree guided by the secret hand of the marketing department through accreditations and via the website – but ultimately her choice reflected which partner picked up the ‘phone over that weekend, was not conflicted out, and sounded sensible when quizzed about the pending US-based case. Given the salaries now levied by business development and marketing managers these days, this is surely not a very satisfactory state of affairs. As Professor Mitch Kowalski reminds us, when choosing Cathay Pacific over other airlines, it does not occur to us to call the captain of the flight we are booking, after all. Cognitive diversity has a quantifiable positive impact on the profitability of organizations. According to the Journal of Management, “functional background variety diversity had a positive relationship with general team performance as well as with team creativity and innovation” (Getting specific about Demographic Diversity, Suzanne Bell and Anton Villado, September 2010). So, it is important that senior members of the law firm staff that are NOT lawyers should be welcomed into the key decision-making process within their firms. However, this is not always the case, as I have learned through direct experience. When considering cognitive diversity, it is crucial to consider the specific task at hand. Of course, for lawyers – whether in-house or private practice – the job of being a lawyer IS risk management. Therefore, the work of experts on risk outside of the legal profession should hold more value to all lawyers than it is currently merited. I have written previously about Nobel prize winner Daniel Kahneman and ‘thinking about thinking’ (reference: “Old wine in a new bottle” by Patrick Dransfield, Asian-mena Counsel February 2018: https://www.inhousecommunity.com/article/old-wine-new-bottle-thinking-thinking/. The work of his former partner, the late Dr Amos Tversky, regarding analysis of cognitive bias regarding risk is also important. Tversky, a cognitive psychologist, once said that he merely examined, in a scientific manner, things that were already known to advertisers and used car salesmen. His work on behavioural economics– both independently and with Kahneman – discovered prevailing cognitive bias which indicated that generally people do not make rational choices but tend to make emotive decisions and put undue emphasis on risks rather than benefits. People also tend to see patterns in number sequences and make connections that are not really there. Tversky and Kahneman’s work refracted choice through the lens of cognitive psychology captured human behaviour better than the once prevailing assumption that consumers are rational creatures who always balance costs and benefits to serve their economic interests. Because of his unique, data-driven approach, Tversky was brought in to advice Delta Airlines on their knotty problem of having too many of their pilots landing ‘planes at the wrong airports. Alarming indeed! The Delta project is one example of an ‘undoing project’ (as explored by Michael Lewis in “The Undoing Project: A friendship that changed the world” – WW Norton, 2016). Tversky observed the situation, trawled the data, and then advised Delta Airlines to redesign their cockpits and also empower the members of the pilot’s team to offer opinions more often and systematically, in order to cut down errors. Being aware of such examples outside of the legal profession would assist law firms in moving away from the social dominance of the managing partner. Many crucial decisions – especially relating to decisions relating to opening and closing offices, which should involve marketing and certainly impacts it – are often subjected to the syndrome of BGITR – or the Biggest Gorilla In The Room. Contrary-wise, business development and marketing folk should not get too far ahead of their partners. Much as I personally loathed the experience of having to work in close proximity to Kevin Geary (recalling that Nuremberg-style fascist Partner Retreat he masterminded on the West Coast still brings a shudder of revulsion), there was something in what he said about not getting too ahead of the lawyers when advising me to curb my own personal enthusiasm for Entertainment and Sports Law in Asia (though now with China tipped to be the world’s biggest film market with over US$40 billion of box office receipts in 2017, maybe my early hunch was not so far off!). All Mercurians reach a point where a management decision requiring Martian input reaches paralysis. The sales skills I learned at Haymarket Publishing came in handy as it had taught me how to ask questions until you reach what is the client’s core objection to making a deal. 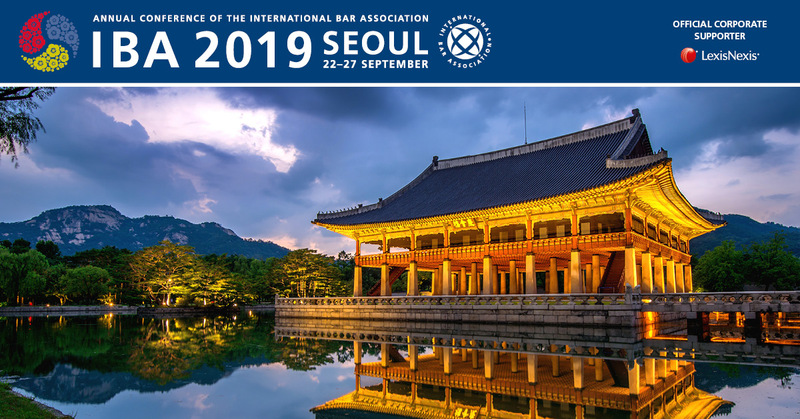 In one legal business development case, an important and strategic conference package was held up because the senior partner felt uncomfortable signing off on a pull-up sign advertising the firm. With that out of the package (a very modest and inessential part of the total budget), all things proceeded to the continuing success of the partner involved. Happily, it does appear that the vanguard of international firms is certainly keen to bring in new talent from divergent disciplines at senior levels. Recent hires in Singapore include three senior managers from the worlds of management consulting and public administration – Laura Cohen-Scott of Clifford Chance, Thomas Greene of Latham & Watkins Singapore and Nick Mider of Clyde & Co.
Tversky’s research was of course data driven and here is some data that I have gleaned to shed some light on who makes up the business and marketing community, at least in Hong Kong. 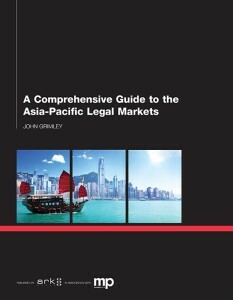 In September 2016 I took a poll of Business Development and Marketing community in Hong Kong as research for a Workshop I presented to APSMA (now ICON): ‘Alive in the Bitter Sea: A persona; survivor’s guide to Business Development and Marketing in Asia (part 2)’. Twenty attendees kindly participated in the poll. The statistics are quite interesting: 90% of the respondents were female; 90% of them worked for international law firms. Four of them had studied Law before moving to marketing; 8 had marketing and / or communications degrees; 2 STEM graduates and 10 Liberal Arts Degrees. None had any sales experience and only limited corporate business experience yet considered Strategy and Client Development as their strongest skills. 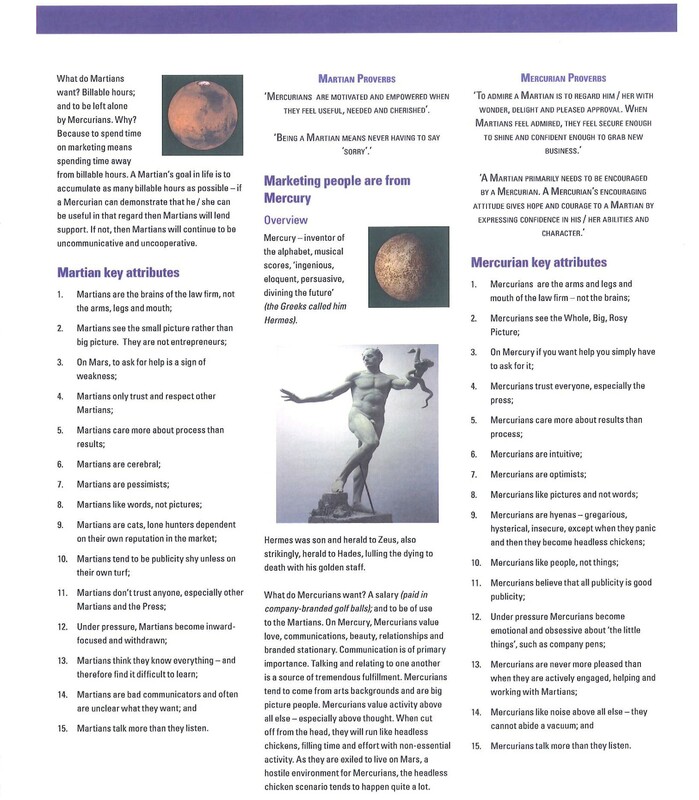 The following descriptions of Lawyers being Martians and Marketing people being Mercurians is not to be taken too seriously and is not intended to upset anyone (although this has already happened in a previous incarnation). Being a Mercurian myself, I have had to work hard to understand the pressures and the point of view of the Martian lawyers I have worked with and continue to work alongside. This is especially the case now that my eldest son Liam is studying hard to be admitted into the Martian inner sanctum and become a lawyer! Further, bringing a Mercurian perspective to the business development and marketing function of a law firm is absolutely necessary and actually what you are paid for. There is nothing worse in my book to find a marketing and business development person becoming a facsimile of their partners; a tendency that I see quite often and always reminds me of the butler who has become more of a snob than the countess that he serves. One final thought – rooting through my old files to find the original “Lawyers are from Mars” hand-out from 2005, I can across an old Financial Times press-cutting in which the late, great Peter Drucker was quoted. Drucker wrote in ‘The Effective Executive’ (1967) that a lack of integrity is the only fatal flaw in an employee because this subverts any strengths that might otherwise benefit the employer. To assess integrity, Drucker suggested, recruiters and managers should ask themselves the question: “If I had a son or daughter, would I be willing to have him or her work for this person.” Integrity is all – being a Martian or Mercurian is just character-type. I am also delighted to say that the Martians who have so been mentoring my own son Liam have demonstrated that essential quality of integrity!